Over the years, I have shared quite a bit about my family’s laundry… everything from why I don’t sort our laundry and my favorite DIY laundry detergent, to my tip to eliminate lost socks and how we manage with only one set of sheets per bed and one bath towel per person. Even still, I get so many requests for laundry-related posts (probably because we all dislike the never-ending piles of laundry)! Normally, I’m NOT one to assign certain days for certain household chores. I have an “I’ll clean it when it’s dirty” mentality that allows me to keep my home fairly neat, clean, and organized without much extra effort (keep in mind I really enjoy cleaning and organizing). That said, for the past year or so, I have felt like our laundry system could be simplified… but I wasn’t exactly sure how. I didn’t want to lock myself into a strict laundry routine or system… but I also didn’t want to constantly feel like I should throw another load in or try to think back to the last time I washed our pillowcases or the kids bath towels. While I would never claim to be any sort of laundry expert, I am excited to share our current laundry system because I feel like I’m finally 100% on top of our laundry every week, with very little extra effort on my part. I certainly don’t expect my simple laundry routine to work for our family indefinitely (or for all of you), but it has been working wonderfully since the start of the school year! This is for a family of 5 with 3 young children, no pets, and I stay at home all day. We do NOT use cloth diapers, and we aren’t at the point where we need uniforms or special outfits washed for certain days of the week. I do all my laundry on the “quick wash” cycle which means I can wash a full load in 45 minutes. Our dryer is also very efficient and dries our clothing in 45 minutes or less… so 4 loads of laundry doesn’t take all that long! Let me explain a little more about our laundry system and why it works so well for us at this point in our lives. 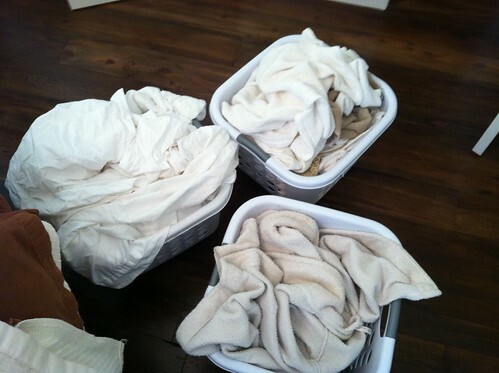 The load of “whites” consists of our kitchen linens (we have a lot of them! ), bath towels and washcloths from the main floor, and anything else I want to bleach. I talk more about how I’ve been washing the upstairs laundry separately from the downstairs laundry in this post. I don’t sort colors or fabrics at all, so I literally wash the entire contents of the upstairs hamper in one load, and the entire contents of the downstairs hamper in another load. Our hampers (stuffed full) seem to hold just the right amount for one large load of laundry, so this works perfectly for us right now — and it makes it SO much easier to put the laundry away again. I know this might be disturbingly gross to many of you, but we usually only wash our sheets once a month. So since we have 4 beds right now, I wash one set of bedding every week. In the summertime, this extra load often includes bathing suits and beach towels; in the winter it’s snowpants, coats, gloves, hats, etc. Sometimes the extra load includes stuffed animals and/or other cloth toys that can be washed, sometimes it’s rugs, sometimes pillows and comforters. Why TUESDAY MORNING and FRIDAY NIGHT? As for Friday nights, Dave and I both usually need a little break from school work and blog work by then, so I get the laundry started right after dinner and once the kids are sleeping, we fold laundry while watching a Netflix show eating some sort of snack we’d never let our kids eat! Also, Tuesday morning and Friday evening are 3.5 days apart — which nicely splits a 7-day week in half, so I have roughly the same amount of laundry to do each time. I wash the sheets on Tuesday morning because no one is sleeping in them at that time (versus Friday night when all the kids are in bed). And the best part of this whole system, I can’t even remember the last time I did any laundry on Saturday! I’m always evaluating my systems and tweaking my routines to fit my season of life, so while I’m thrilled to have found a laundry system that works for now, I do not expect this system to work for our family forever. And of course, I don’t stick to this exact system 100% every single week. There are times of the year when we have more laundry, times when we have less, times when Dave needs something washed ASAP, times when we’re gone on Tuesday mornings or Friday nights and the laundry gets pushed back a day or more… but for the most part, this has been my laundry system for the past 5+ months. I’d love to know what laundry system or routine works for YOU! Also, here’s a link to ALLLLL my laundry related posts. Our Landscaping: Before and After! At what temp. do you wash things? I started washing my towels in hot water after reading your post on stinky towels. I never use bleach, though. Can you bleach your colored towels – like even the kitchen towels with red stripes that you pictured? I usually wash lighter clothes in warm and colors in cold water, but if I could throw in everything together, that would be great. Everything else is washed in warm water because Oxyclean works best in warm water and I use Oxyclean in all my non-bleached loads. Which load do you wash your reusable nursing pads in (when you are using them)? I’ve been throwing mine in with the baby’s wash but sometimes I need to wash the pads but she doesn’t have enough dirty laundry. Is it gross to put them in with our clothes? Just curious on someone else’s thoughts on this. Hi, Andrea – thank you for the always helpful tips! I do have a question about your system for bleaching your towels and washcloths etc. I’m always a little fearful of bleach and not doing it right. However recently I’ve noticed my husband’s t-shirts and some of our other items are looking dingy and the stains really aren’t coming out. How do you actually do the bleach in the laundry (pour it in the basin? soak?) I have OxyClean and sometimes add that in, but think I want to go the bleach route. Thanks for any tips! No need to be scared of bleach 🙂 However, I should mention that ALL our towels, washcloths, sheets, blankets, napkins, etc. are white or cream — so that’s why I bleach them all. If you have brightly colored towels, I probably wouldn’t bleach them. That said, I am NOT an expert on laundry, but I simply pour a little bleach in the “Bleach” compartment of my washing machine and pour a little detergent into the “Soap” compartment of my washing machine. Also, if you use Oxyclean, you should dump that directly into the barrel of the washer before putting your clothes or water in… and do NOT use bleach with oxyclean. Right now I do the “load a day” plan. It seems to work really well considering the amount of laundry two people create. We have a dog that sleeps on our bed and I rotate old sheets out daily to protect our comforter. I sort our laundry and also wash our sheets every week. I love sinking into fresh sheets on a Sunday night! 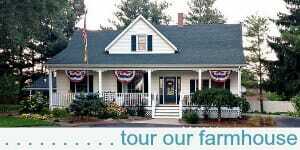 We live on a working farm and also work off the farm plus we are involved in some organizations that require dressing up for meetings, etc. We wear many hats which creates a lot of laundry! I have been trying to do better with hanging dress clothes back up that were only worn for a few hours. I like that we don’t spend entire days folding laundry. I have friends who literally cancel on me because they need to get caught up on laundry. What?! I, however respect priorities and sometimes you just have to stay home and get things done. BUT, I never want to be that person with piles and piles of laundry to the point where I have to cancel plans. Monthly washing of the sheets for our house too! But I can’t get my husband to part the all the “extra” sheets and towels, he wants them “just in case.” I think one extra for each person ( bedding and sheets) plus 1 set for the guest bed is plenty, he thinks more is better to be prepared. Andrea, I do have to ask, what water temp do you wash everyone’s clothing at? And what setting (regular, delicate, etc)? We do our kids laundry all for one person in one load, regular setting, warm water temp. But my Husband does 2-3 small loads, each in different water temps and cycle. I have been doing my laundry 2-3 smaller loads, also only because I felt like I had to wash my clothing at the “recommended” setting to make them last, but I’ve noticed that clothing doesn’t last as long as it used to. So what the point in wasting time if the outcome is the same? As for how I wash — I always use warm or hot water and I never sort by material. I also wash anything dry-clean only in my regular machine and have honestly only ruined 1 thing in my entire life. I guess I tend to agree that clothing is cheap and doesn’t last long nowadays anyway, so why waste my time sorting it and doing all different loads. I shove everything in with a scoop of oxyclean and don’t even worry about spot treating it! My kids are old enough to be in charge of their own laundry, so I just do mine, hubby’s and the dogs! One load gets done each day, start to finish! With 4 kids I used to do 20ish loads a week! It’s much easier now!! wow — that’s a great system! I have a family of 6 and I do 3 loads of laundry a week and that includes sheets that I weekly….My secret is each of my 4 kids are responsible for their own laundry and sheets. They each have one day a week assigned to them to do laundry. They aren’t allowed to do laundry on any other day unless who was assigned that day is finished. It has worked well for 3- 4 years now. My youngest who is 9 is required to do his laundry also. I do help him to transfer his clothes from the washer to the dryer because he is too short to reach into the washer. They all do a great job. The girls tend to stain treat while the boys don’t really care. I every ones laundry when we return from a weekend away or vacation. That’s great. I never did laundry growing up, but have thought about eventually (in several more years) teaching my kids to do their own. I don’t have much of a laundry system anymore…unless you call “wash when the baskets are full” a system. HaHa! But when the kids were younger Friday was laundry day and I washed and dried but they brought it down, sorted it, and took it up and put it away when finished. If I went upstairs and it was still in baskets there were consequences. This was when they were about 10 years and older. 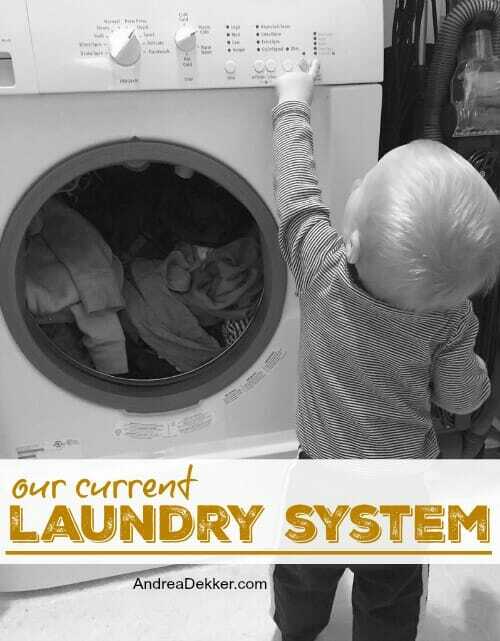 My system definitely changed throughout the years…I remember being so happy when we could finally do it at home instead of hauling it out to the laundromat. I just did a mountain of laundry for my daughter last week while she was at the hospital with her youngest. I washed, dried, folded, and separated it into piles according to whose it was and where it went, and it’s still sitting on her table 4 days after getting home. I wish she had a system! well that always used to be MY system too — whenever the baskets were full, I’d throw in another load. That worked for awhile, but then the baskets would be full and I wouldn’t be home that morning, and then the kids would be napping and I didn’t want to get their dirty clothes out of their room, and then I’d be making dinner, and then it turned into “wasting” all my evenings doing laundry. Also, I can’t even imaging needing to cart all my clothing to to a laundromat — wow! I have a family of 4. I do laundry once a week usually on Tuesdays. I do all of our laundry in one day. It is convenient, because the dryer never has to reheat for a new load. I remember to get it out and fold it, rather than wash and forget about it. There are times when someone is sick, has an accident or snow days, pool days I may have to deter from this and do a load not on my designated laundry day. But this works so well for my family. I too divide up my laundry in 2 days. Sunday I do EVERYTHING I possibly can. I start after church and keep moving the laundry through all day long while I clean, pay bills and get ready for the week. It is usally 5-8 loads. Then on Wednesday morning I run 1-3 loads depending on the week and spend about 45 minutes in the morning after everyone leaves straightening the house so it doen’t get too out of control. My kids should be doing their own lundry by now (15 and 17), but I actually like my routine and I don’t want to be limited by when they have clothes in the wash! Would you mind sharing the brand and model number of your washer and dryer? Our dryer is taking 2 hours to dry (after the repair man visited). I enjoyed this post. It gives me hope of a speedier process for my family soon. we have a frigidaire front-loading, stackable washer/dryer combo. It was here when we purchased our house 6 years ago. 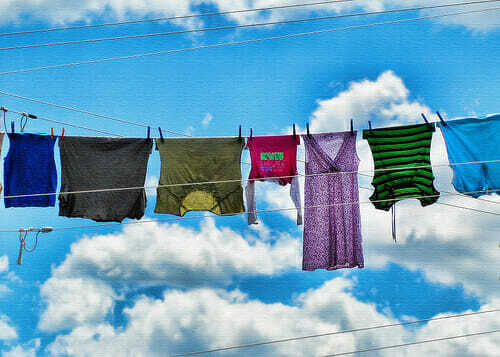 I have the best laundry system of all – my husband!! 🙂 When he was unemployed he took over the laundry details. He is very organized and would set his phone timer to go off just as a load was finished so he could switch it to the dryer and start the next one, etc. He also was very prompt in folding and putting away. (We are almost empty-nesters, with only a high school senior home yet. So only 3 people to create laundry.) He could get the laundry done in about 3 hours, while it took me all day, because I kept forgetting to switch loads, fold, etc. So, when he once again was employed, I informed him that the laundry would continue to be his responsibility because he does it so much better than I do. (I work full time during the school year, he also works full time year round now.) I do the laundry during the summer, but it is not done nearly as efficiently as he does it. He does laundry on Sunday afternoons while reading or watching football/basketball. A great system for us! Love your system! I need to figure out a system for ironing. I know you don’t do much, if at all, any ironing because of the clothes you choose to buy/purchase. I, on the other hand, still have items that need it. One of these days I’ll get a system to work. 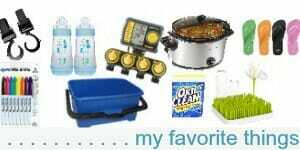 I have a loose house cleaning/laundry plan I like to stick to as well. It just helps me to cycle through them all without having to remember when I did it last. One less thing to remember these days is a very good thing! I also do not sort clothes. Everything goes in together, on the quick wash. It’s so much easier than trying to remember which socks are which daughters/mine. It comes down in one basket and goes back up in one basket. I like reading what other people find helpful to them just in case I’m missing something…so thanks for the post!! I love a good laundry post! We have the world’s smallest washer and dryer. I try to do at least one load a day and then take 2 days a week (usually Tues and Fri) to empty the laundry basket completely. For any of your readers who do use cloth diapers – I washed cloth diapers for 4 years (2 children, 2 yrs. 4 mo apart in age). 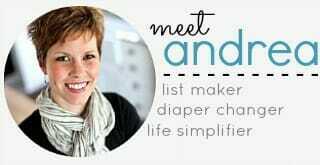 I never had any issue with washing diapers every 2 or 3 days – daycare and I placed dirty diapers in a zip-up wet bag, and I had about 5 or 6 of those. When I would do laundry I would just invert the bag into the washer and throw the bag in after it! Now that my kids are out of diapers I still do laundry every day – one load a day is much easier for me to handle as a full time working parent than spending all day on Saturday doing it, but I get why some people prefer to do it that way. My lightbulb moment in the last year was to sort darks into 2 loads – one load is darks I don’t care about – pjs, underwear, socks, kid clothes – and I run that load when I’m not sure if I’ll get around to folding it right away. That way if it sits and wrinkles it’s not a big deal. The other load of darks is clothes I absolutely do not want wrinkled AND clothes that have special care, like hanging up to dry. Now when I do the “don’t care load” I can toss straight from washer to dryer without further sorting or pulling items out to hang. The “I care” load gets sorted for items to hang up and I time it so I’m available to quickly address it when the wash and dry cycles end. I love how this is totally about your house, your family, and your schedule right now. Monday is our quiet home day and has been for years, so that is laundry day. My kids (an dhusband) tend to remove clothes everywhere so I sort and do the clothes (lights, darks, pants, delicates) and fold and sort by delivery location out of the dryer. I often have an extra random load (towles, or sheets that get washed as needed). Kitchen laundry, and cloth diapers get washed whenever they are full. What I struggle most with is getting the laundry put away so stretching it out to a load a day would mean it would never ever be done. Sounds like a good system — and it’s probably nice to have all the laundry done right away at the beginning of the week! Our family of 3 has 5 loads a week, so I do 1 load a day and take the weekends off. Having a routine deffinently makes it less overwhelming. Yes! And I love having the weekends be “laundry free” for the most part! I wash sheets once per week but I wash our sheets one day and our kids’ sheets on another day. Regular laundry is one load a day and towels as needed, but i do work full time outside the home so I really don’t want to fill up my whole weekend with nothing but laundry and cleaning. My husband also coaches high school football and track so it would be a nightmare if we didn’t wash something every day as well. I absolutely loathe doing bed linens. We only have one set per bed now as I sorted through the linens last year. I try to stick to washing one bed per week as that works pretty well for us. However, the rest of the laundry is two loads per day to keep on top of it. We are now a family of five, three of which are teenagers. There’s also sports (sweaty and smelly), military (heavy fabrics with lots of different fasteners) and my hubby’s work clothes (grimy, sweaty and smells like fuel). I do sort as it helps with the treating and drying process and keeps the clothes nicer longer, see previous parenthetical sentence. 🙂 The great news is the kids and hubby do help with the whole process. Thanks for all the great posts! I do at least one load a day, either light in the evening so I can hang it out the morning, or early when we wake up (around) so I can hang out after I dropped the kids at school. I have two kids with school and sports uniforms, and all four of us train, so there’s always a lot of sweaty stuff. At least on load each day quickly became the standard, as making beds. I was bed linen once a week in summer, once in two weeks in winter, and do that on the 30 min cycle – all the fitted sheets and pillow covers first, then the flat sheets and duvet covers. I do have double sets for each bed – it just makes my life easier. Once a month sounds fine to me – it’s about what I do too. But I am curious – what is a snack that you would not let your kids eat? haha — hot fudge brownie sundaes are our favorite! I have to say I wasn’t too excited when I started reading your blog today. Silly me! Excellent ideas, Andrea!!! Washing linens at my house overwhelms me so I put it off (once a month sounds great to me). Really like your simple plan. Just chiming in on monthly sheet washes – doesn’t sound gross to me! It helps that my husband and I generally shower at night, we’re getting into bed clean, not after a day at work/doing housework/etc. I am fairly tidy and like to have a picked up house, but that is one area I just turn a blind eye to.